3 Bedroom Detached House For Sale in Oxford for Offers in excess of £550,000. 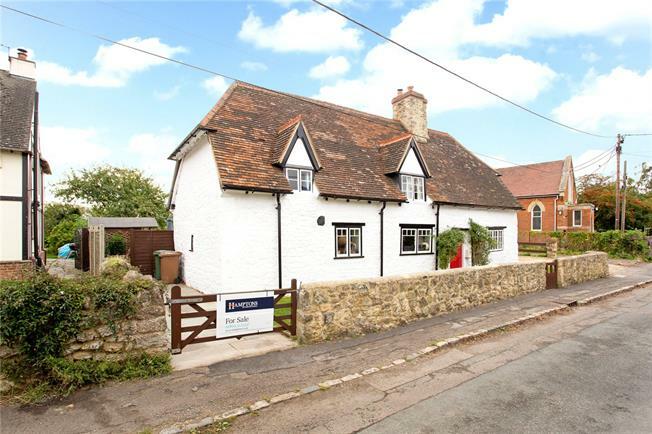 A charming detached stone built cottage under a clay tile roof with a rambling rose around the front door. The property has a wealth of character features including exposed timbers and is extremely welcoming throughout. Downstairs the accommodation comprises a spacious reception hall and sitting room with wood burner and exposed ceiling timbers, a snug/play room and a modern kitchen breakfast room with farmhouse style units and access to the terrace. To the first floor are three good sized bedrooms and a family bathroom with roll top bath. The master bedroom has a vaulted ceiling, exposed beams and a stylish ensuite shower room. South Hinksey is a pretty village situated one mile from the centre of Oxford which can be accessed via cycling or walking across the Devils Backbone and Port Meadow into Central Oxford. ‘The City of Dreaming Spires’ is world renowned for its university and architectural beauty and has been home to royalty and scholars for over 800 years. The property is superbly located for a wide range of schools, the City centre, theatres, museums, cinemas, shops and restaurants. Oxford mainline railway station offers regular trains to London/Paddington. The property has a gravel driveway which offers parking for several cars. There is pedestrian access via a front gate and pathway which is flanked on both sides by a pretty stone wall and lawn area. To the rear the property benefits from a sunken terrace ideal for outdoor entertaining and a 100' garden which is mainly laid to lawn, interspersed with trees and commands views over the neighbouring field. Although part of South Hinksey sits in the 1 in 100 flood risk area, this property has had flood defences fitted and is fully insured. More details can be provided on request.